Are you in the mood for LOVE…poetry, music? Come to dinner! For a mere $55/ticket, you and your LOVE can join 4 poets and a musician as you celebrate Valentine’s Day! 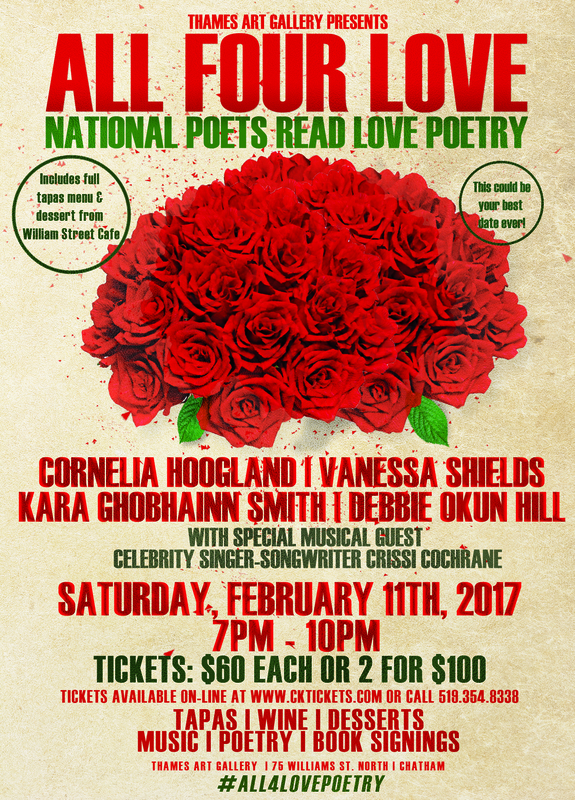 Join poets Kara Smith, Debbie Okun Hill, Cornelia Hoogland and MOI as we give your our best LOVE poetry! On vocals, serenading us with love songs, Crissi Cochrane will be part of this spectacular LOVE event – like no other, we can assure you! This LOVE-filled event will take place at the Thames Art Gallery in Chatham. This is a beautiful location, and the evening includes a tapas dinner by Willian Street Cafe, wine, dessert and prizes! We will feed your body and your heart! Purchase your tickets ahead of time because this evening will surely sell out. Let us know you’re interested and/ or coming via our Facebook Event Page! This will be a night to remember. A night that will load you up on LOVE. Poetry. Music. Food. Wine. I mean, it’s pretty perfect, right?